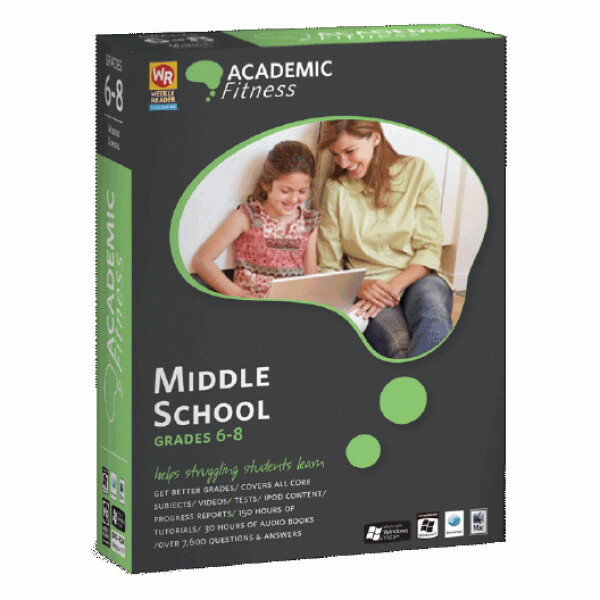 Academic Fitness Middle School from Weekly Reader is the latest way to ensure your knowledge is in tip-top shape. The program is comprised of the tools necessary for improvement in school: interactive computer software, video lessons, printable and onscreen tests, iPod Content, Audio Books, and the new BookReader which allows you to record your students textbooks. There is even a parent's section that allows parents to stay involved and monitor progress. The interactive computer software presents questions that correlate to the content learned in Middle School, so whether you are slowly moving through or building up speed, you can be sure that you are adding muscles to your brain. With thousands of interactive questions and answers, it makes learning fun and continually interesting all while building confidence and knowledge retention. The lessons utilize a proven multi-sensory approach that guides students through each subject while appealing to all types of learners. During the lessons, students can use top-notch reference tools to assist them with any questions. Words in blue can be clicked to display a Merriam-Webster dictionary and defines the word for them. Words in green can be clicked and it pops up an encyclopedia that suggests related topics for non-linear learning. Special on-screen and printable quizzes, combined with special assessment tools, let parents monitor progress and participate in their child's education. The program also includes iPod lessons so students can take lessons with them on-the-go. Supplementary audio books are included so you can use any MP3 player as well.